When is a College not College? When you're here in New Zealand. The term "College" here is equivalent to high school in The Philippines. I surmise this is the British schooling system, as compared with ours which has an American approach to it. That's just my theory though, so feel free to correct me. The kids from both countries start out with Kindergarten (or Kindy. There are also Day Care Centres and Creches) for kids 3-4 years old. I attended Kindergarten also when I was a kid and that was that. On to grade 1. So I am truly bewildered by other schooling options that we have for today's kids. There's Nursery, Pre-school, and also Day Care Centres. We did not have those back in our time :-). At age 5, kids here start formal schooling. That's Year 1, and they are in Preparatory School til Year 8 (12 years old). And then they start College! That's Years 9 to 13 (13 to 17 years old). This is also called Secondary School. After this, education continues for many through a trade school, polytechnic, or a University (also called Uni). It was quite confusing at first but we soon got the hang of it. Another familiar institution is Kumon. There are Kumon centres here; we were actually thinking of having Jo-Lo enrol in one before our application to migrate was approved. 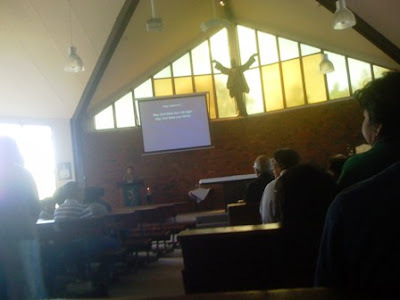 13April 2011 Update: Filipino mass is no longer being celebrated at Johnsonville. For the updated schedules, please visit the Filipino Chaplaincy website. Thank you. I remember going to mass on a Sunday in the Philippines is an event by itself, especially in Manila and in Dolores, Quezon. During weekends, entrepreneurs are usually allowed to display their wares outside the church grounds and it looks like a small fiesta when the mass is ended and people would troop to their favorite vendor and buy pasalubong or to eat on the walk home. It is usually food, ranging from cooked meals, rice cakes, fruits, cold treats, and street food. A Filipino atmosphere is prevalent here in Johnsonville, Wellington every third Sunday of the month at 12:00PM. For this is the Filipino mass, with the priest saying mass in Filipino, the songs in Filipino, and the masses of churchgoers have predominantly black hair and beautiful brown complexion. And when the mass is finished, you will find yourself squeezing along the corridor with Filipino favorites on sale: rice cakes, smoked fish (tinapa), hopia, siopao, dinuguan, pancit! Aside from catching up on comfort food, it's a nice place to meet fellow Filipinos as well. 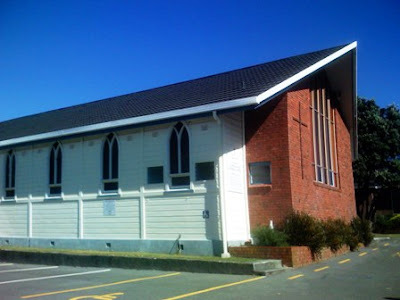 Catch the Filipino mass at Saints Peter and Paul Catholic Church, located in 29 Dr. Taylor Terrace, Johnsonville. 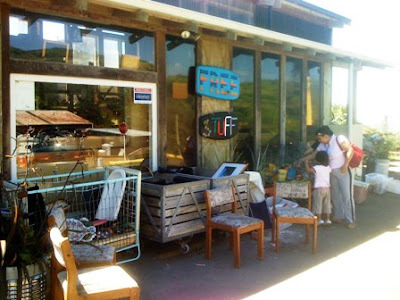 Learn more about the Filipino Chaplaincy in Wellington at Filathome. It is surprising that a lot of things that are still in good condition can potentially end up in the rubbish bin here in Wellington. However, thanks to the conservation awareness efforts of the Ministry and through the efforts of charitable organizations, a lot of these get a second life in the form of used goods that people can buy at a discount. 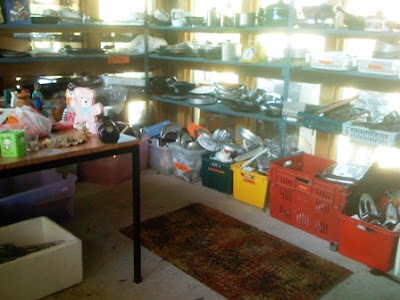 When you need something for your house (a table here, a chair there, some clothes, appliances perhaps), check out garage sales which are run by families getting rid of excess stuff which can run from four hours to a couple of days, particularly during the weekends. This is advertised in the Trade & Exchange paper which is available from your local dairy, or at the community bulletin board in your nearest grocery store. You can also take a look at the goods offered by organizations whose profits benefit the less fortunate. 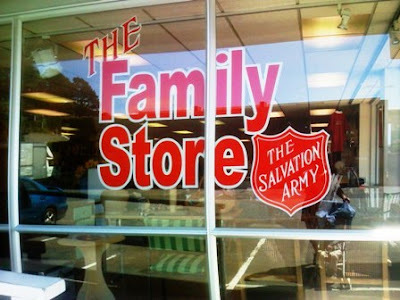 Take for example the Salvation Army Family Stores. 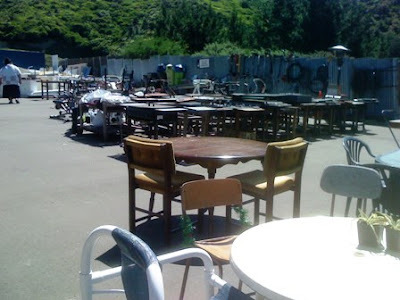 They sell quite an assortment of goods, from dinnerware to tables chairs, beds and clothing. 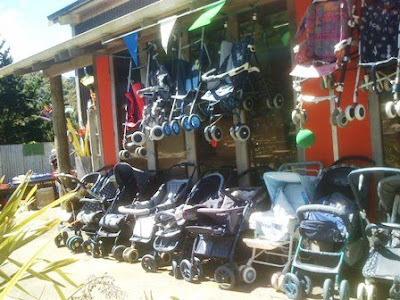 The Sallies, as they are more popularly known, use the proceeds from their shops for their community work. 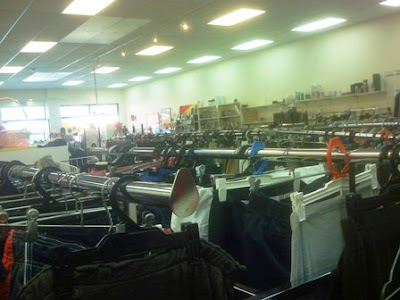 They have quite a presence here in the Wellington area, and there is bound to be a Family Shop in a major town. You can even have a free stuffed toy for your kid when you shop here. 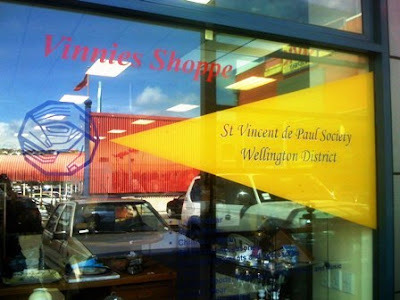 The St. Vincent de Paul Society also runs a similar drive; their shops are called Vinnies Shoppes. There is one such store in Johnsonville. They sell clothing at a dollar each, but they also have plates, bric-a-brac, furniture. You can also volunteer your time in helping out run the store. Just approach their counter and ask how. And then there's the Trash Palace. 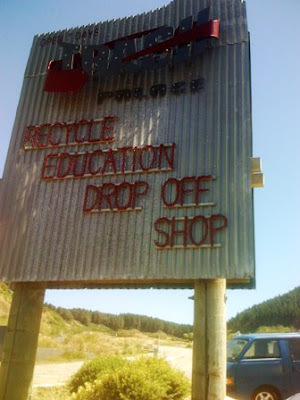 It's a recycling center located in Porirua. This is quite a large place, and they have lots of stuff on sale. Right in front of the store is a Free Stuff area, where you can get plates, cuttlery and books that you can simply get and drive home with. 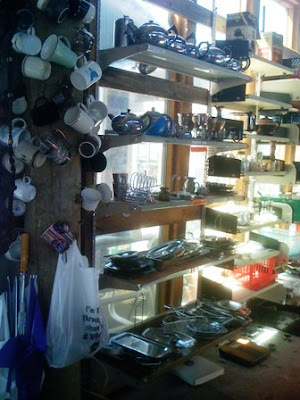 Or, enter the store and get to find a lot of stuff that you can still seriously use for a long time. This is the free stuff area. 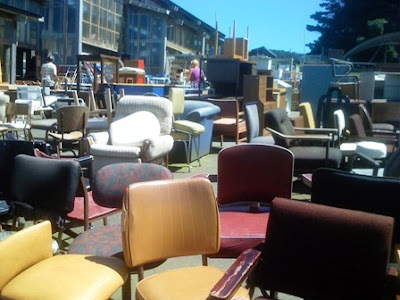 Many of these chairs are still structurally sound. You just need to upholster them. As they say, "one man's garbage is another man's treasure." 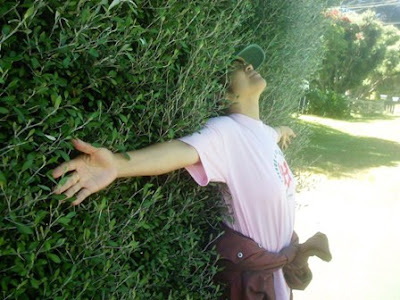 But in this time of environmental crisis (and shall I add, recession? ), I saw a slogan in one of the stores here that is more appropriate: "refill, not landfill." Wait, that's hardly appropriate. Ummm... you get my drift. A special Valentine greeting from the Blogkadahan members, created by Mec. 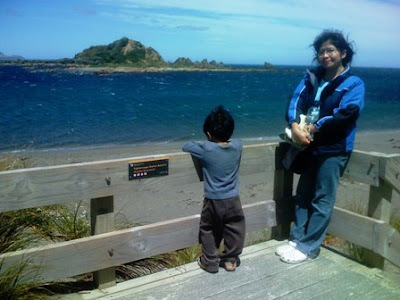 We were at Island Bay last month looking for a new place to move into and we sort of got lost and ended up walking along the road by the beach. The view there was breathtaking! 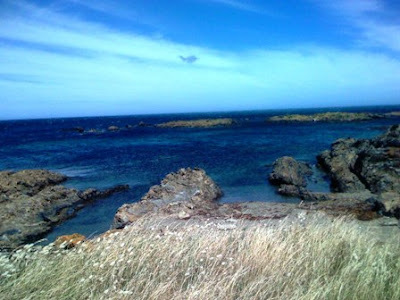 The ocean was bluer than in other areas, the ragged terrain looked like it was something out of this world. 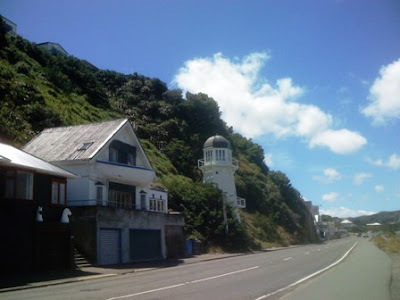 We walked along this road - the Promenade - which runs through the southern coast of Wellington. It was a very windy day, so much so that strong gusts would occasionally blast sand and small stones into the air. 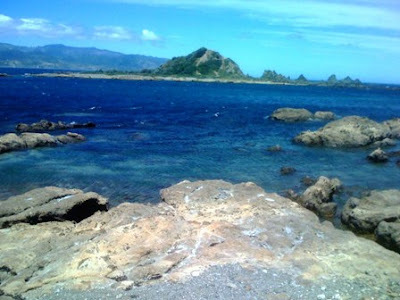 Very visible is the Taputeranga Island. 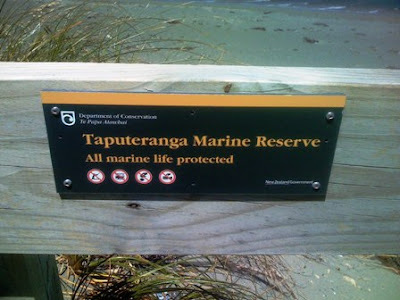 As a marine conservation area, the island is being rehabilitated to become home to indigenous plant species, with natural protection by the sea from occasional intruders. 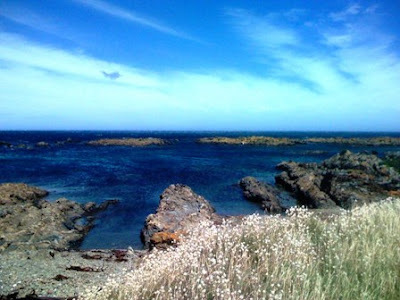 There are also many species of fish and aquatic life in the area as a result of the combination of cold and warm waters converging in this area. The place is truly a photographer's dream. A natural beauty, it is also a popular place for research and efforts are being made to conserve the area. We got lost, but along the way we found this wonderful place! 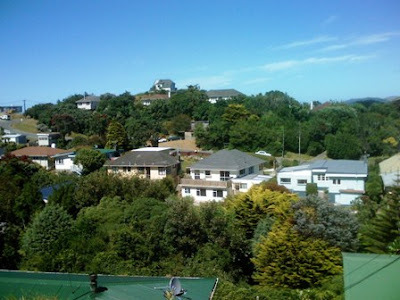 Even though we come from a city blessed with pine trees and beautiful flowers, we still fully appreciate the greenery that Wellington provides. 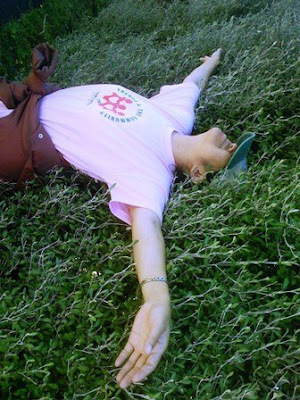 Here, my wife is clearly enjoying lying down... the grass? A view from atop Black Rock Road in Newlands. 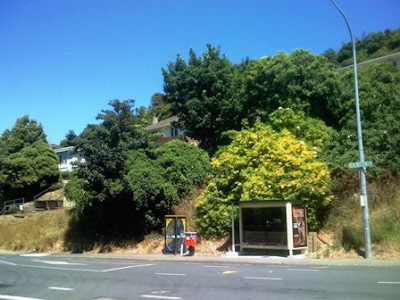 This is how some bus stops here look like: shade to protect from sun or rain, a bench for a comfortable wait, advertisement billboards on either side, and a rubbish bin nearby. This one below has a phone booth as well. 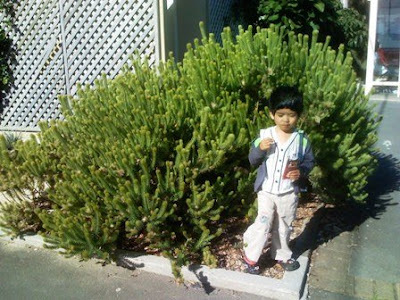 Jo-Lo munching on crackers before a strange looking bush.